Our flat pack kitchen wall cabinets and units come in a choice of five finishes so you’ll always find the right solution for your kitchen redesign project. 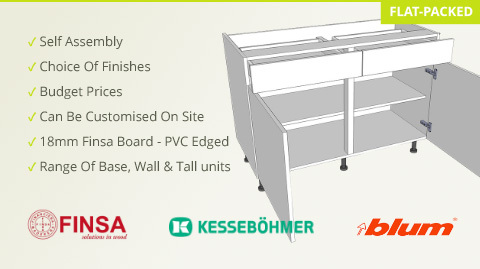 Although they’re designed for self assembly, our flat packed wall units can be customised on site and are supplied with a fitting guide to make it easy for the intrepid DIY-er. Our range of flat pack kitchen units includes single, double and corner units, as well as top boxes.